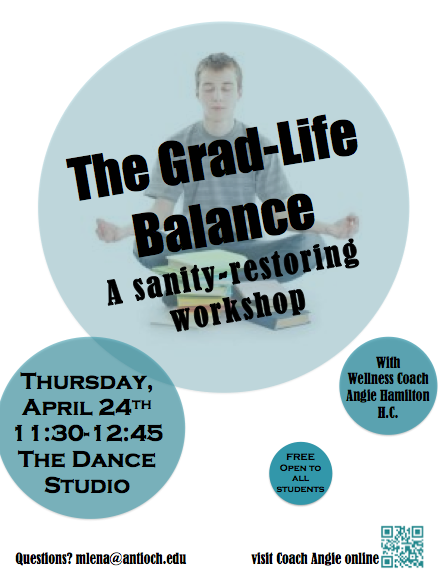 A workshop for graduate students at Antioch University in Keene, NH. Working with students two weeks before the end of their semester, I did exercises to bring attention to the area of their lives that are suffering at the moment, and lead group discussion on how to bring balance to all aspects of their lives. After discussion, many students were able to see their own personal tribulations in a rosier light. We also discussed techniques to employ when in the throes of extreme stress to ease tension physically and emotionally. Walk-in holistic health coaching sessions at Equilibrium – Wednesdays 12pm and 2pm. Sessions are 20 minutes long and cost $10. Equilibrium is located at 14 Elm St. in Brattleboro, VT (behind TJ Buckley’s). A great option to begin on a path to better health. We will discuss what your main health concern is, and come up with one or two strategies to begin working toward your health goals. Sometimes you just need to unload and be heard, ya know? Be sure to check out lunch hour sessions with other fine practitioners Thursday-Saturday. I spoke to six classes of health students (mostly underclassmen) during their nutrition week about holistic health as it relates to nutrition. Piggy-backing on their previous nutrition week lectures, I compared the USDA My Plate graphic with the Integrative Nutrition Plate (a holistic version of the same graphic). We discussed the various facets that make up our total mind & body wellness, bio-individuality, food sensitivities, and my top tips for eating well. I LOVED talking with the teens about wellness! They were so great! 2012: Happy, Healthy Holidays – A two-part workshop to prepare your table and your nerves for the holiday season!